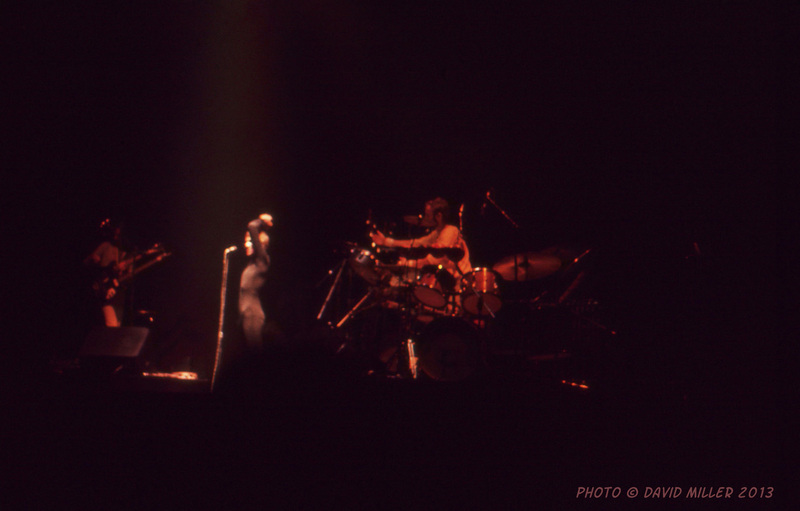 Editors Note: A brief history of the early years of Genesis, with photographs and memories of their performance at Winterland in March, 1974, can be seen here. 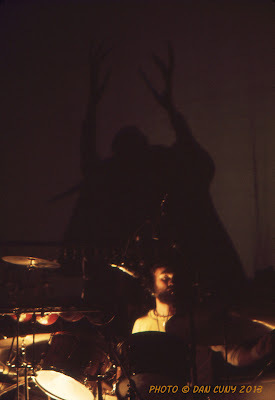 In November, 1974, the British musicians of Genesis released their seventh album, The Lamb Lies Down on Broadway, a double LP on which Peter Gabriel (vocals, flute), Tony Banks (keyboards), Mike Rutherford (guitar, bass), Steve Hackett (guitar), and Phil Collins (drums, vocals) combined their musical skills to tell the extraordinary tale of Rael, a young man in the streets of New York City, who becomes lost in an underground world where he tries to find his brother, John, and has strange encounters with a number of unusual beings. 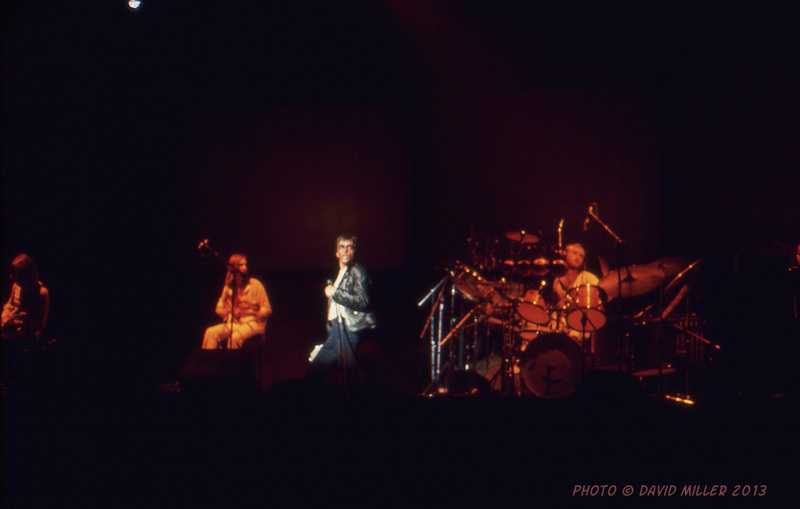 It was the most ambitious project that Genesis had ever undertaken, with a bold mixture of rich melodies and imaginative lyrics, and it also marked the end of Peter Gabriel's membership in the band. 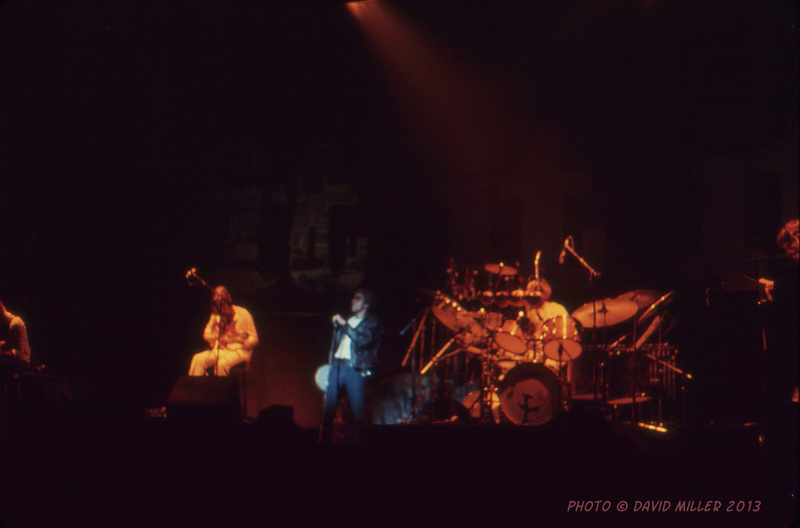 Genesis mounted an extensive tour, beginning in late 1974 and continuing through May of 1975, to promote The Lamb Lies Down on Broadway, performing the entire album at venues in the United States, the United Kingdom, and Europe. Peter Gabriel appeared onstage as Rael, wearing a white T-shirt, bluejeans, and a black leather jacket. 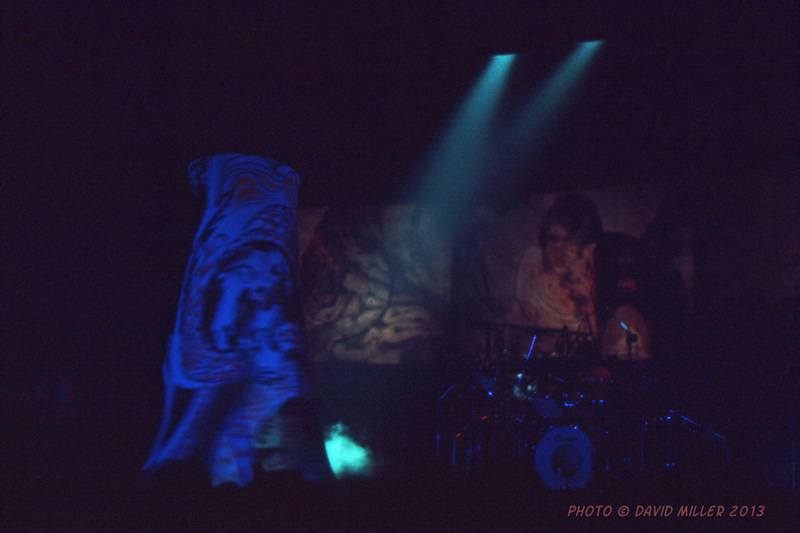 Later during each performance, he wore several different outfits to portray outlandish characters from the story. 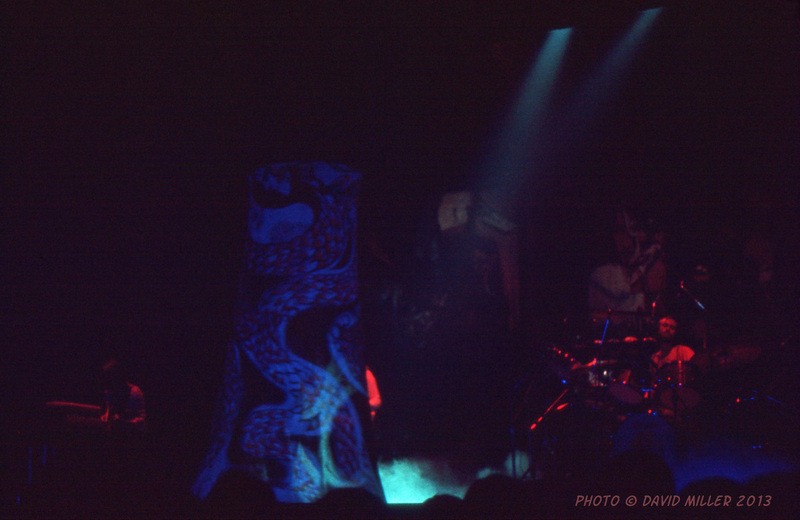 On three screens behind the musicians, fanciful slides were shown as they performed, to augment the flow of the storytelling and to enhance the visual element of the show. 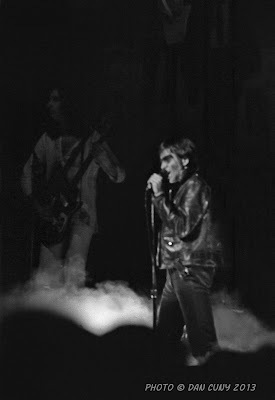 There also was a particularly arresting moment when it seemed that Peter Gabriel and his "twin" were standing on opposite sides of the stage at the same time. When Genesis brought The Lamb Lies Down on Broadway to the Berkeley Community Theatre in January, 1975, it was only their second appearance in the Bay Area. 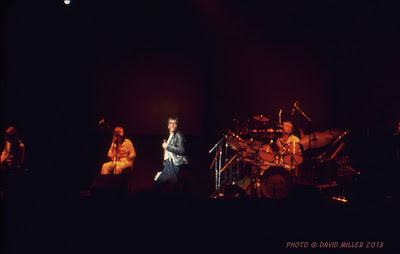 They had performed at Winterland ten months earlier, to a smaller crowd, but since then, their music had begun to reach a wider audience, strongly helped by Peter Gabriel's reputation as a distinctive showman. 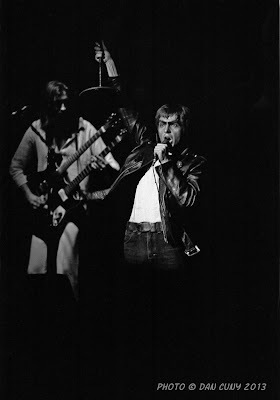 Unfortunately, Peter Gabriel had decided to part company with Genesis, and after the end of the tour in 1975, the band was left without a lead singer. In time, the other members of Genesis moved forward together (with Phil Collins accepting duties as main vocalist), and succeeded to a degree that greatly extended beyond the minor gains of their earlier days. Peter Gabriel also went on to achieve a high degree of fame, becoming a major star in his own right. 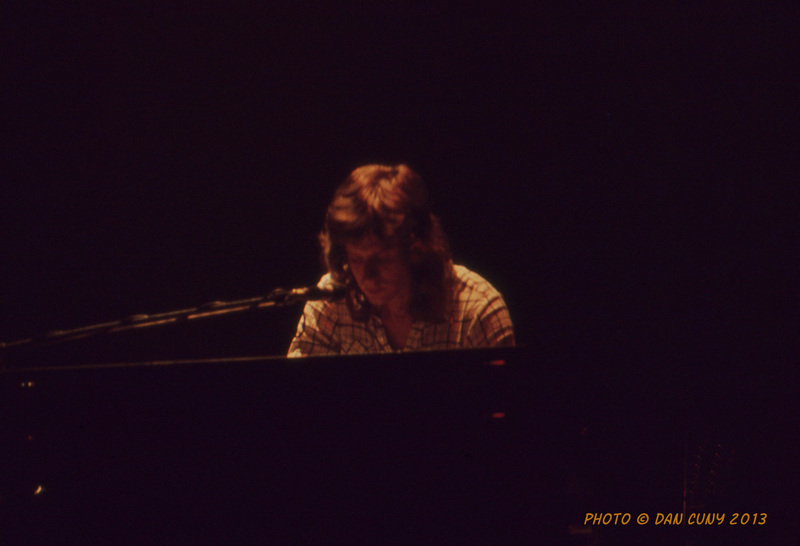 David: Although it is difficult to remember a concert thirty-eight years later, I do recall moments from this concert very well. 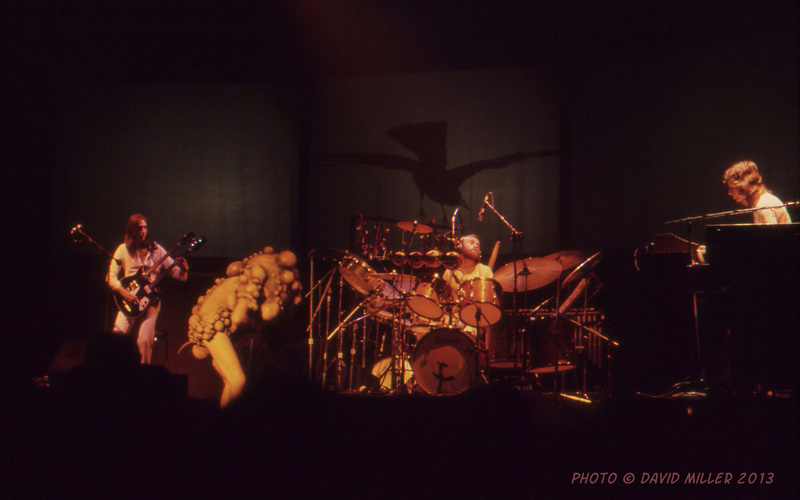 My friends and I had seen Genesis the previous year, during their first tour of the West Coast in the USA. 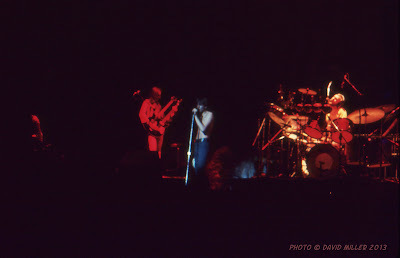 They had just released Selling England by the Pound, and had established themselves as a major band in the progressive rock movement of the time. We jumped at the chance to see them again. The Lamb Lies Down on Broadway was still new at the time, which made it difficult to fully appreciate the music at the concert, but we knew that Peter Gabriel was going to create a performance unlike anything else that we had seen. We were right about that. The theatrical aspects seemed darker than before. No Peter Gabriel dressed as a flower, no Union Jack outfit, or pretending to mow the lawn. 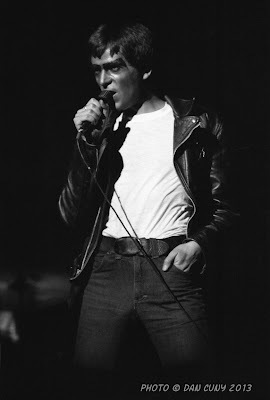 Instead, he was in a black leather jacket, white T-shirt, and jeans. His face was marked in black makeup, and he scowled at the audience with a menacing look. 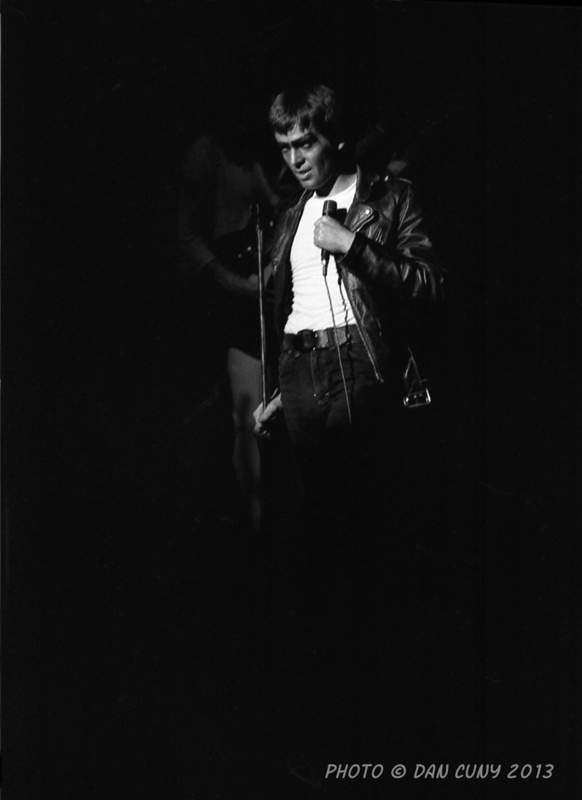 A street punk on Broadway? 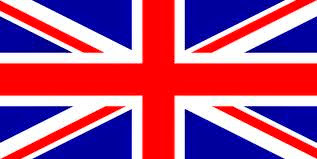 I had thought of Genesis as strictly British, but this had a very American look to it. At one point Peter Gabriel removed his jacket and shirt to reveal a very boyish body. 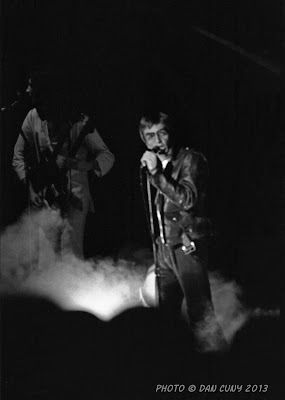 He prowled around the stage as he sang, leaning in close to Phil Collins and Steve Hackett, as if he were threatening them. 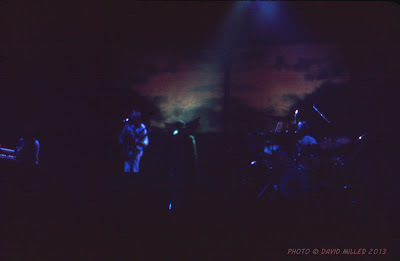 The backdrop had black-and-white photos projected on it: people's faces, old castles, ravens. Not yet being familiar with the album, none of this made any sense to me, and things were to become more confusing. 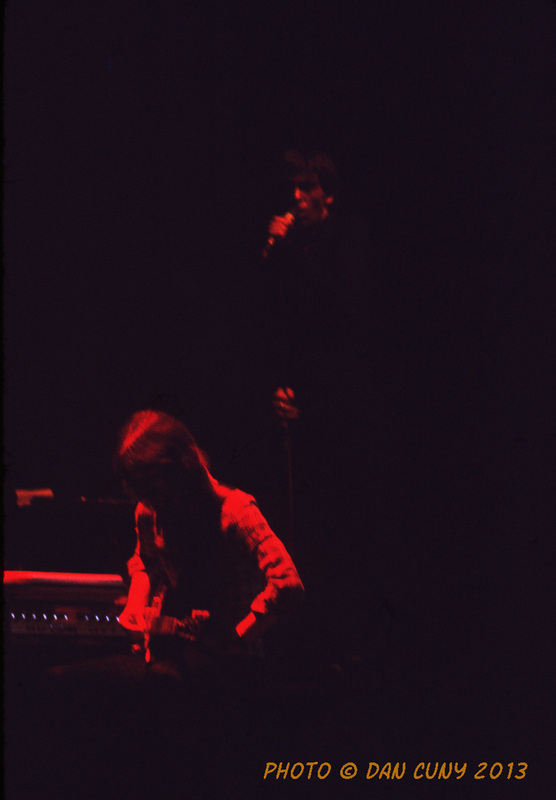 I was quite stunned at one point when the stage went dark, and suddenly Peter Gabriel appeared at both sides of the stage at the same moment! I looked quickly, wondering how I might get a photo of this, but I was not able to, as the figures were too far apart. 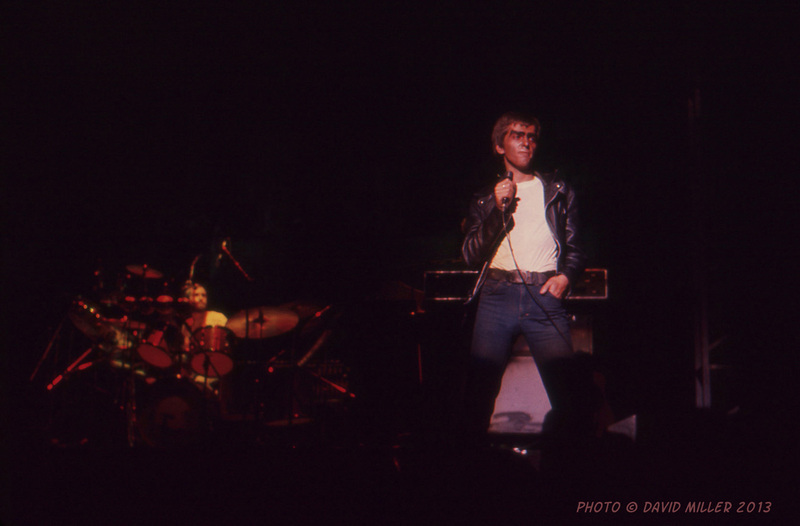 I could not tell which one was the real Peter Gabriel. It looked as though they had used a life-size hologram. The lights went out once more, and when they came back on, Peter Gabriel was a single person again. At another point in the show, as the band played an instrumental, a colorful, spinning cone, lit with black lights, moved across the stage. 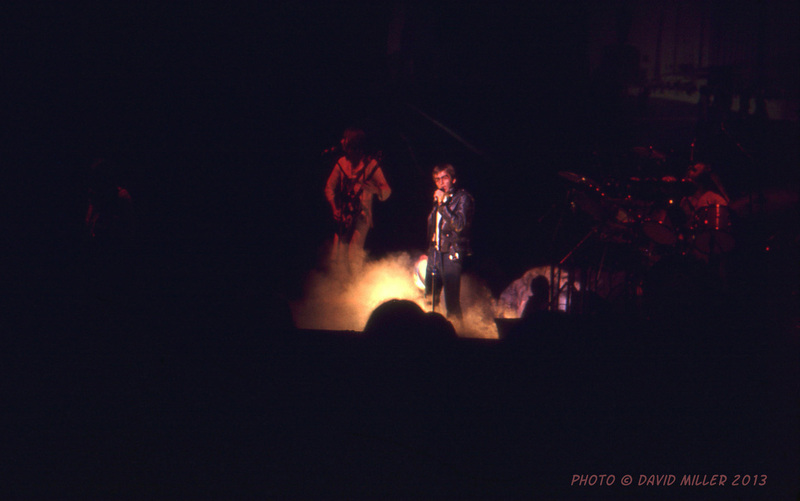 I was able to get a few photos, although its particular significance is still unknown to me. The theatrics were different, but the music was still distinctively Genesis. Tony Banks' surging keyboards, Mike Rutherford's pounding bass, Steve Hackett's guitar with sustained notes, and Phil Collins' tasteful, yet powerful drumming were very recognizable as Genesis. 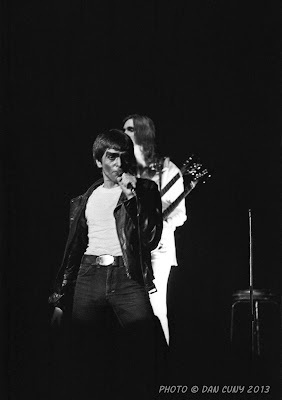 Peter Gabriel's vocals were still strong. Together they could create a sound like no other. 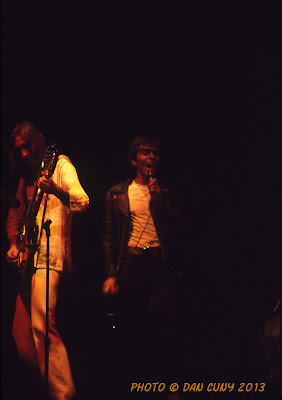 Then another appearance of Peter Gabriel in costume. This time he was in orange tights, with his head and body covered with deformities. 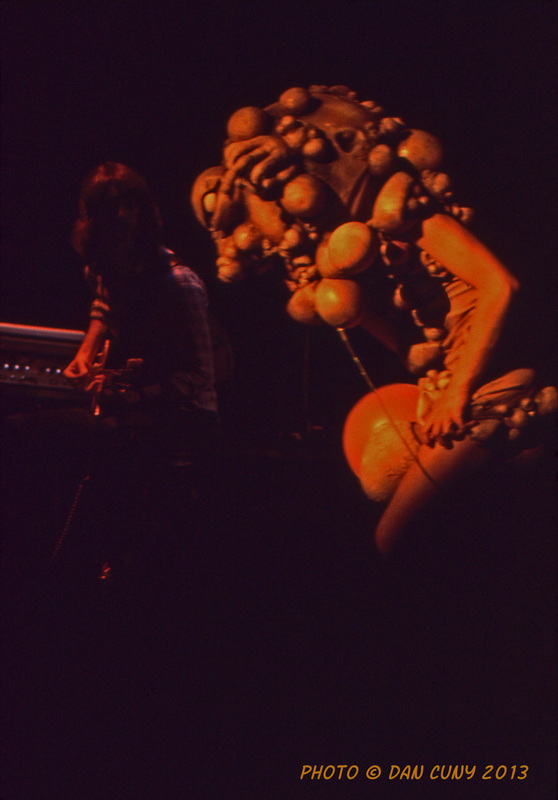 He appeared to be wearing balloons attached to a costume head, with a a giant mouth and bulging eyes. 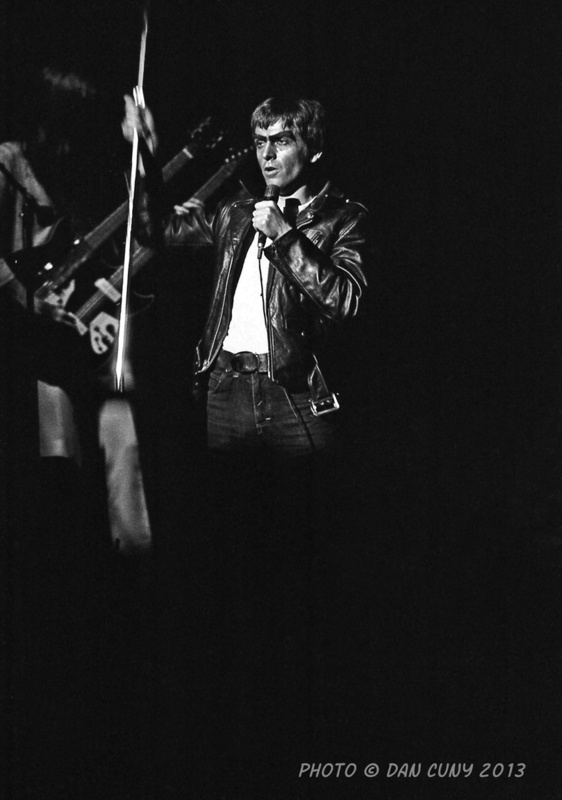 He twisted and turned around the stage, while the rest of the band continued playing as before. I think this was, visually, the most impressive and memorable part of the show. 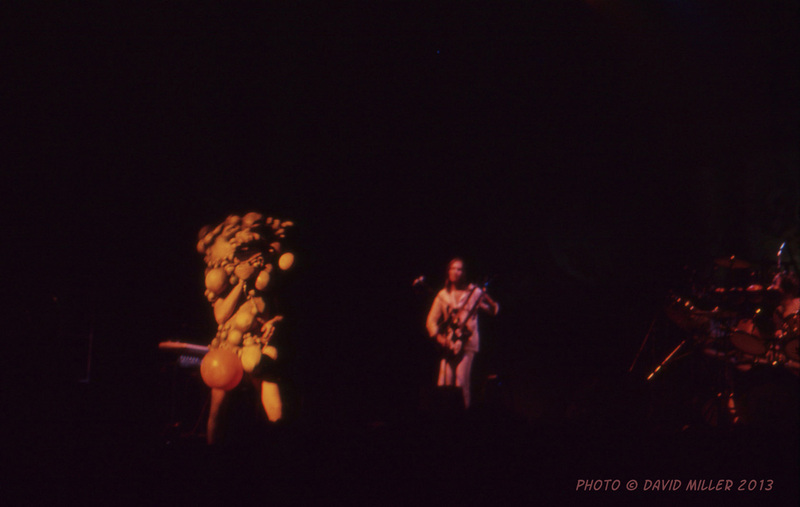 The last numbers were old songs, including "Watcher of the Skies" from Foxtrot and "The Musical Box" from Nursery Cryme, which was performed much the same as in the past, with Peter Gabriel in the old man costume. Looking back on this, I am struck with the feeling that we saw one of the last great art rock concerts. 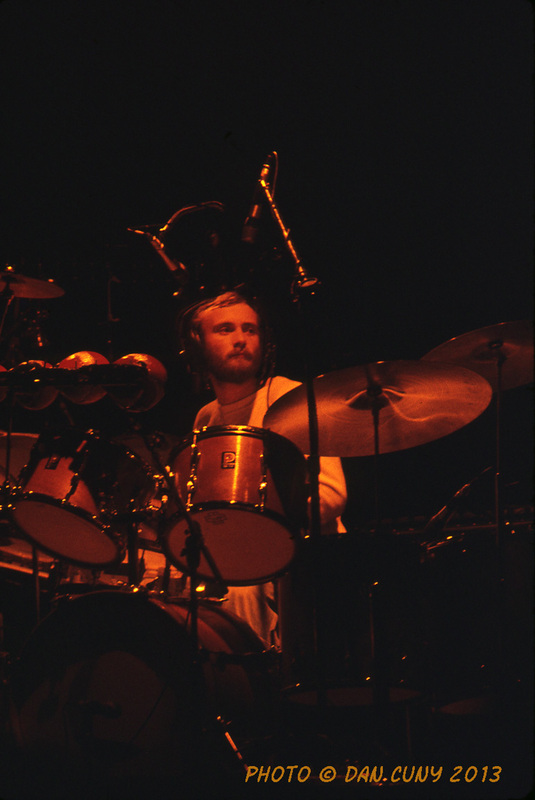 Genesis went on to sell many millions of albums with Phil Collins as lead vocalist, but in my opinion, their later music paled. The early 1970s were over, and the music scene was changing. I think it was the end of an era in rock. 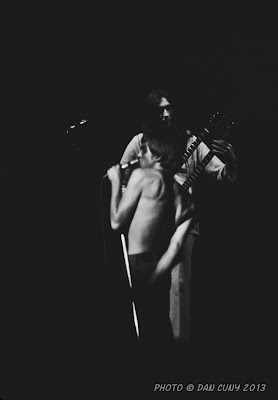 The experimental music was fading as tastes changed and the music industry became more about money than art (although it was always about money). 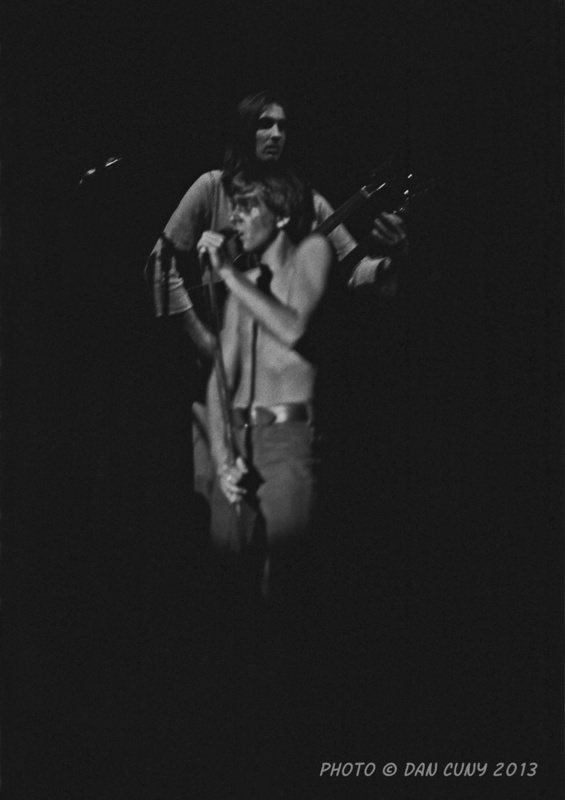 Many musicians became famous in the early 1970s without even having a single on the radio. FM radio played entire albums and music that was otherwise unknown, but FM later became the same as AM radio, mostly playing songs that had the most commercial potential. Many of the major British artists produced some of their greatest work in the early 1970s: The Who's Quadrophenia, Jethro Tull's Thick as a Brick, Elton John's Goodbye Yellow Brick Road, Pink Floyd's Dark Side of the Moon, David Bowie's The Rise and Fall of Ziggy Stardust and the Spiders from Mars, Yes' Close to the Edge, Emerson, Lake and Palmer's first album, and Mike Oldfield's Tubular Bells. 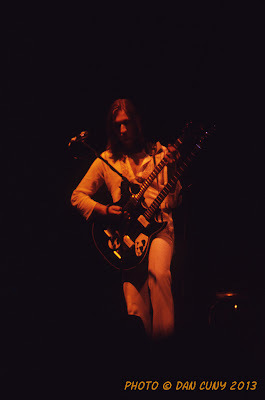 The early 1970s was a unique period when anything seemed possible. Bands such as King Crimson, Soft Machine, Renaissance, Van der Graaf Generator, Rare Bird, Gong, and many others were stretching their creative wings and finding an audience. In 1969, we took a giant leap forward with a man on the moon. 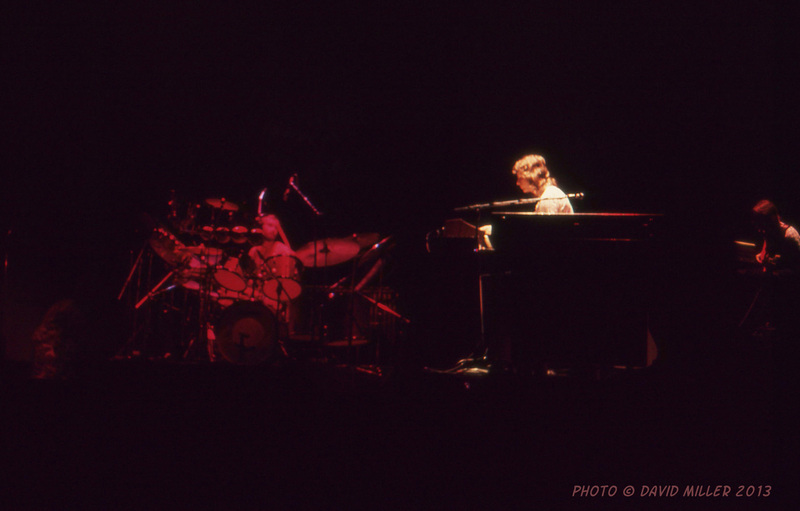 In 1975, we took a giant leap backward in music artistry. I doubt that we will ever see or hear anything like we did in those years again. Gary: I remember waiting outside for the doors to open at the Berkeley Community Theatre. We went a bit early, so as not to miss the beginning of the concert, and I remember having a hard time finding a place to park. 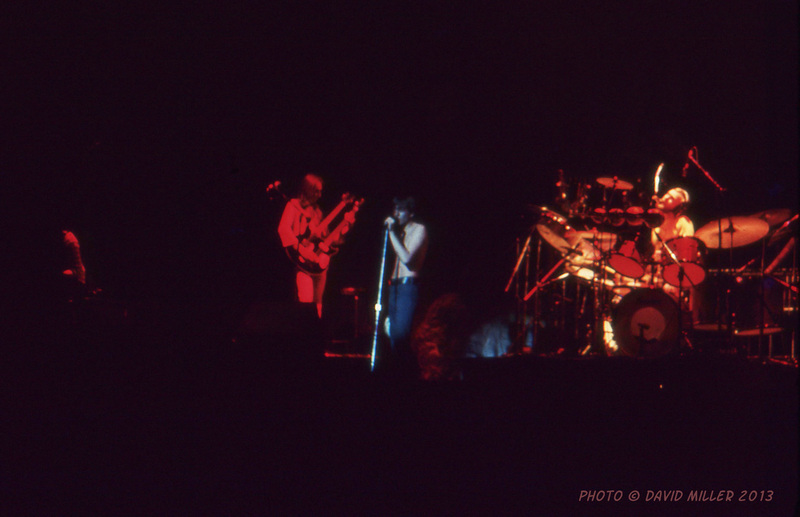 The image of Genesis in my mind was from Selling England by the Pound, the album that was current when we saw them at Winterland in 1974. I was unfamiliar with their new music. I didn't like The Lamb Lies Down on Broadway as much as I had liked their earlier LPs, though in retrospect it was a very creative piece of art. 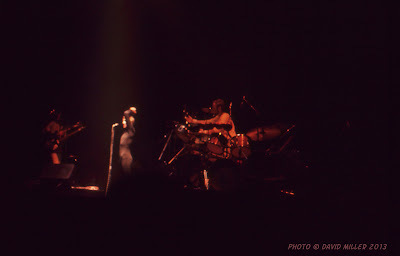 The musicianship of Genesis, on the LP and at the concert, was first rate, as always. 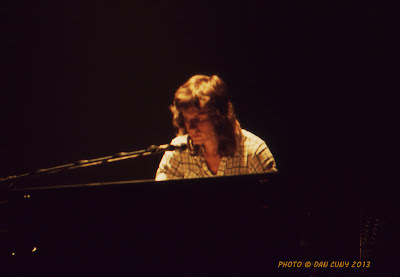 Tony Banks had the classical chops. Phil Collins (whose later solo career I didn't like too much) was a powerful, talented drummer. 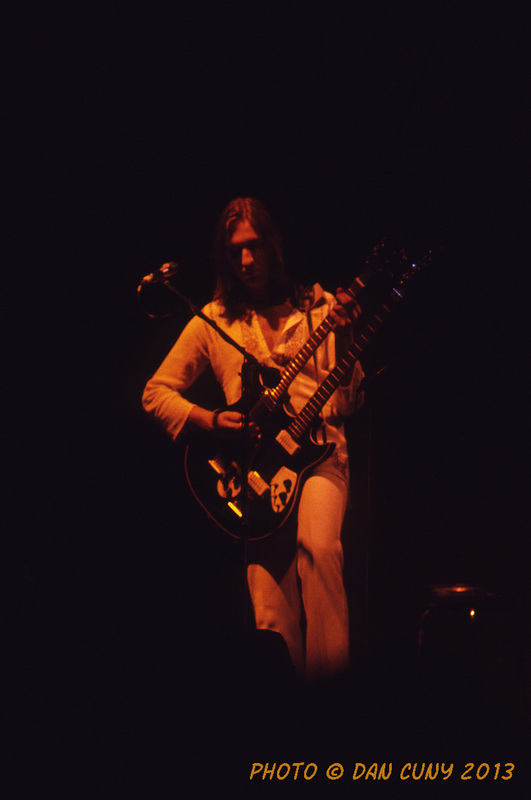 Mike Rutherford was a solid anchor with his intricate bass playing, as well as his fast strumming capabilities and odd time signature work (a crucial part of the Genesis musical engine). Steve Hackett's bent note playing on guitar, along with his melodic (and sometimes harmony) playing with Tony Banks really drove the compositions. 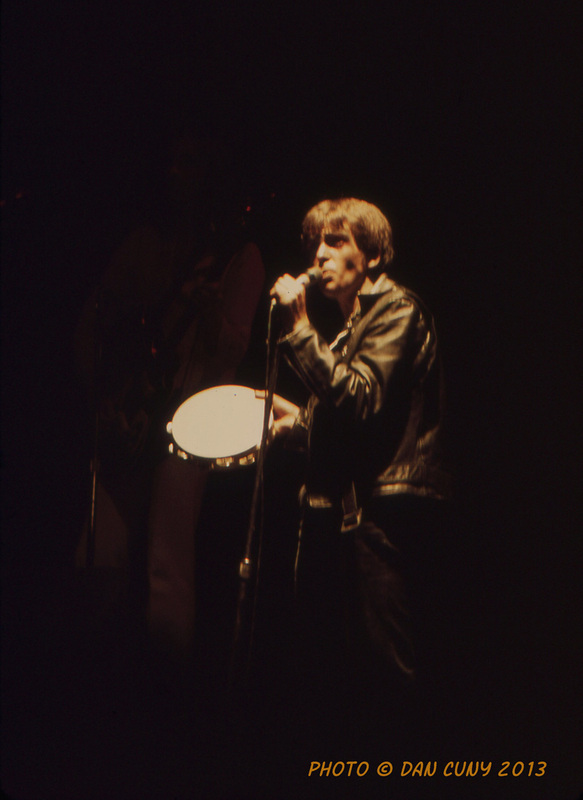 Peter Gabriel's flute playing also deserves recognition. The flute is a hard instrument to master, and his sense of melody was strong. 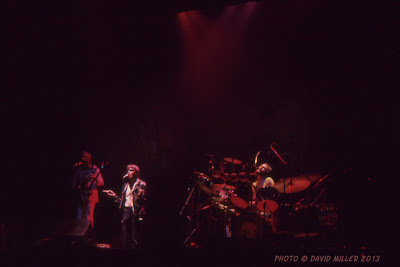 What a band! 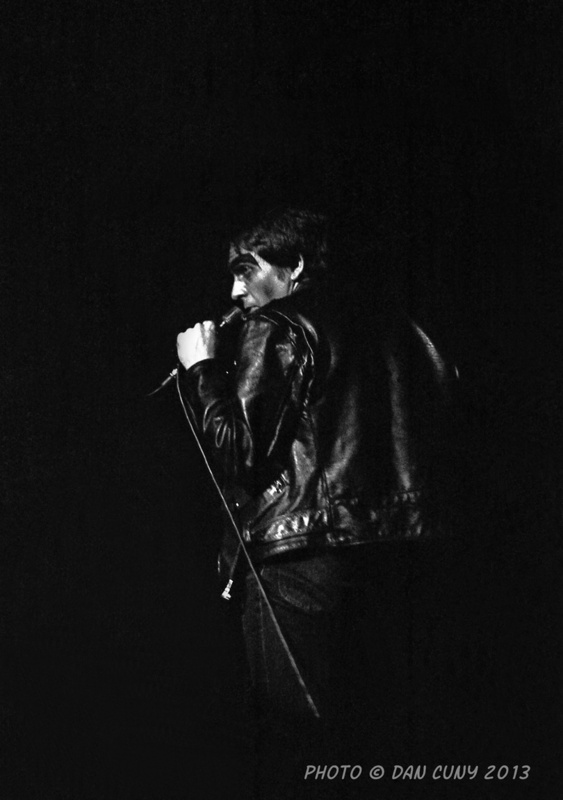 Peter Gabriel was dressed in a black leather jacket, like a NYC Puerto Rican punk. Very interesting. The Slipperman costume was outrageous, but Peter Gabriel was never afraid of being controversial. He actually appeared to embrace it, with great gusto. I think that was what made Genesis so powerful. 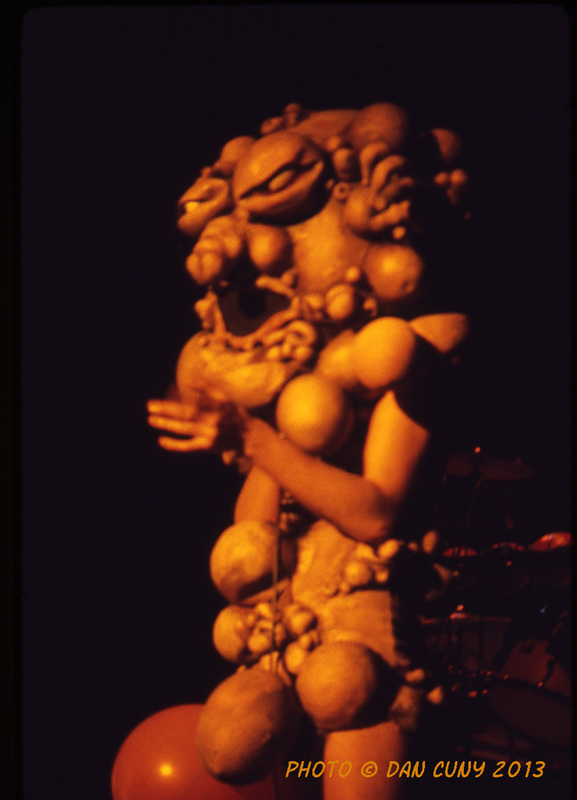 The concert was enjoyable, but Peter Gabriel was soon to split from the band. 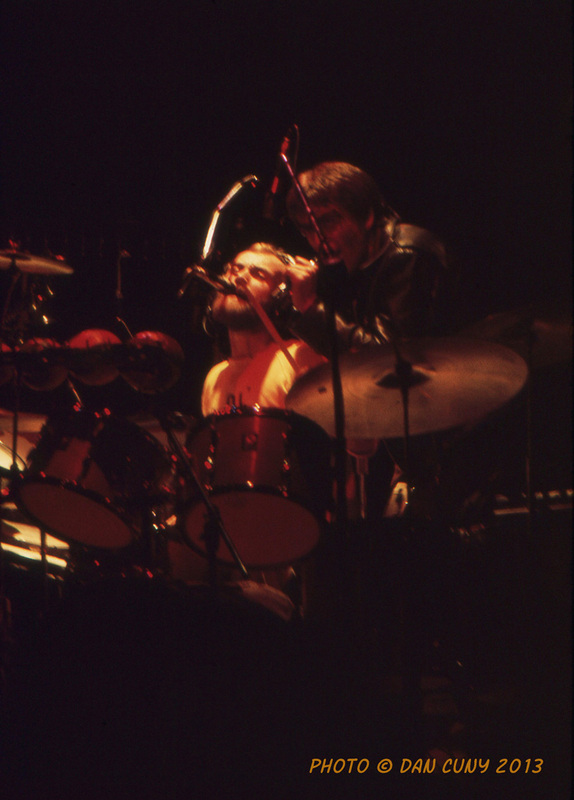 I saw Genesis (without Peter Gabriel) in 1976, again at the Berkeley Community Theatre, during the tour for A Trick of the Tail, and the concert could not have been more different. 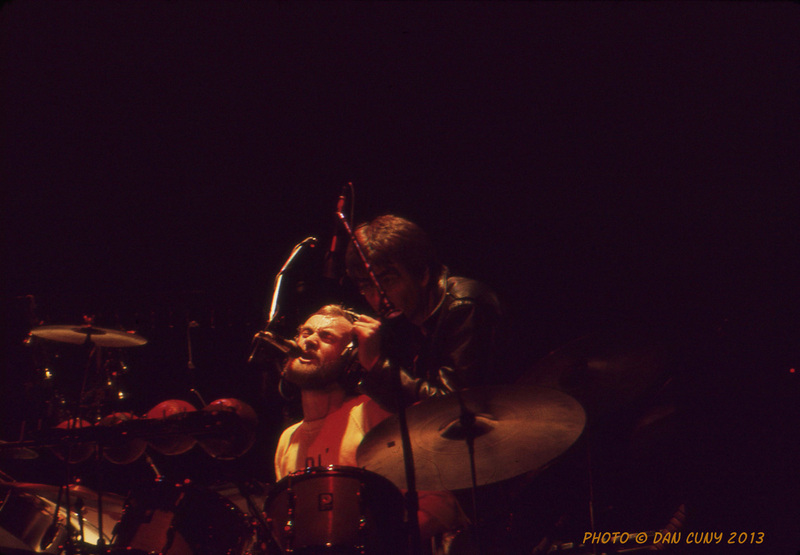 Without Peter Gabriel's input, Genesis was never the same. I'm glad we saw them when we did. They were a great band. 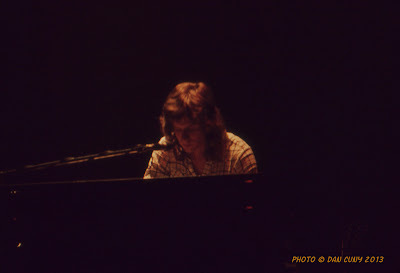 Dan: This is a concert that I went to with Greg Copeland, my best friend in high school during my junior and senior years. He and I were into the same music as my other friends, Gary, David, and Michael. Greg, like me, was also into photography. 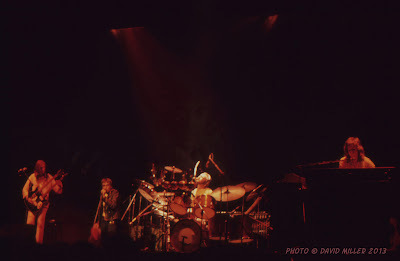 We had purchased our tickets a few months before the concert, which was part of the tour that Genesis did with The Lamb Lies Down on Broadway. I had missed the appearance by Genesis at Winterland in March of 1974, when Peter Gabriel did many costume changes. 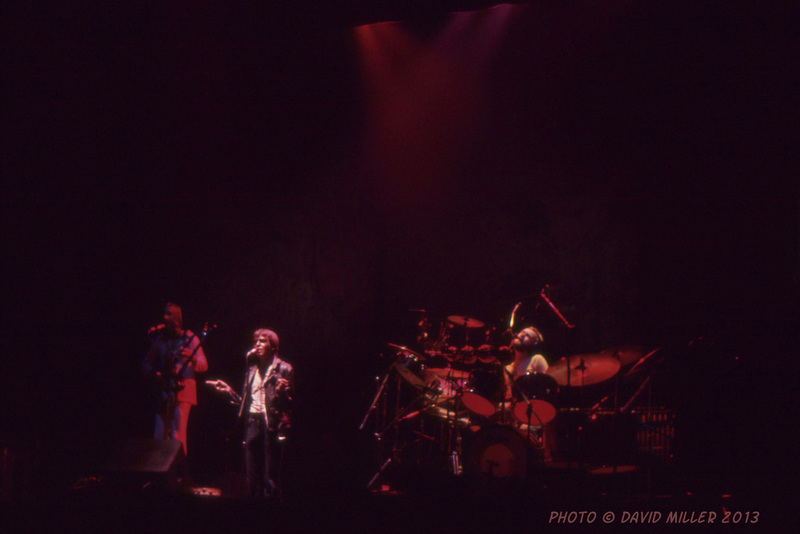 I wasn't going to miss this tour, especially since The Lies Down on Broadway was one of my favorite albums. I can remember the band taking the stage, starting off with the opening of The Lamb Lies Down on Broadway, with Peter Gabriel in a leather jacket and makeup on his face. 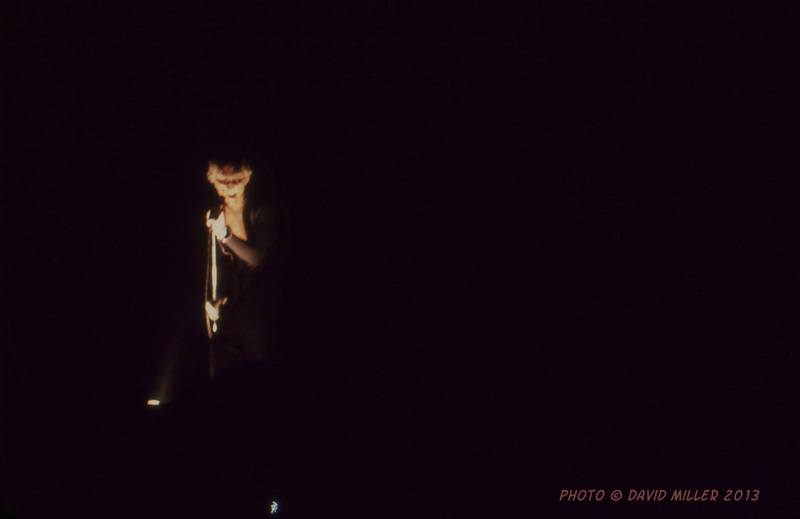 We were not sitting close to the stage, but we were near the center, so I had a good angle for taking the photos. 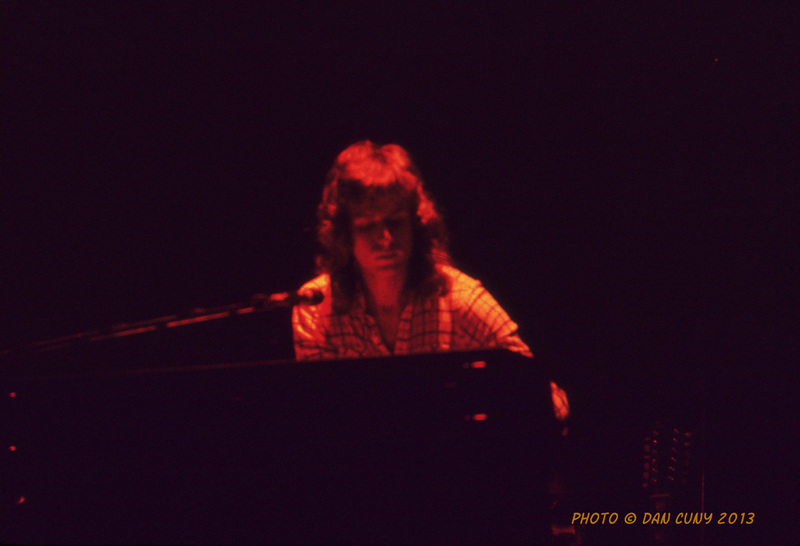 The band performed well, with Tony Banks and Mike Rutherford mostly in the background. 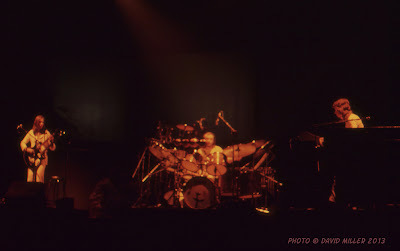 Steve Hackett and Phil Collins were a little more highlighted, but the main attraction and visual point definitely was Peter Gabriel. 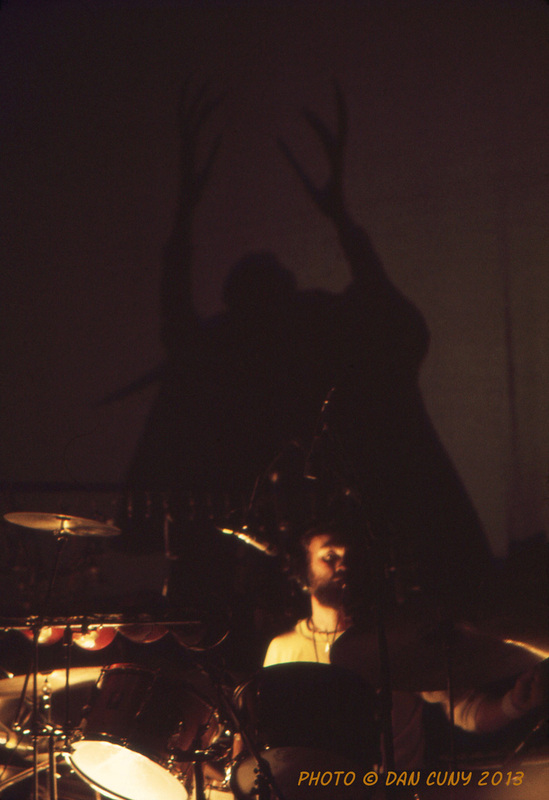 He did do a few changes of costume during the show, and there were some interesting visuals, but they generally stayed within the confines of the album. When they left the stage, they were called back and did a couple of encores, which included "The Musical Box" and "Watcher of the Skies," a song from Foxtrot, and one of my all-time favorite songs by Genesis. This was an outstanding concert, and something that I was really happy to see. 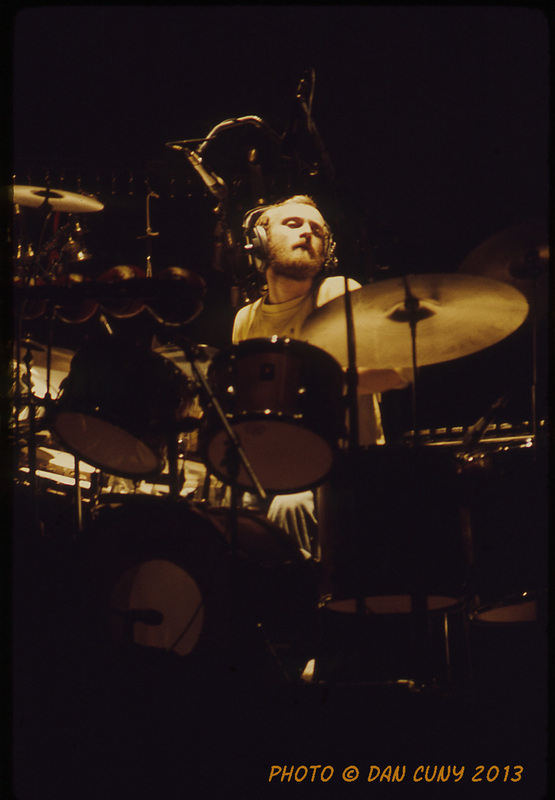 Michael: The second time that we attended a performance by Genesis, at the Berkeley Community Theatre, was quite different from the first time that we saw them, at Winterland, but both performances were utterly amazing. The primary difference was that, between March of 1974 and January of 1975, Genesis had started to receive airplay on FM radio in the Bay Area, and as a result, their music had gained more fans. 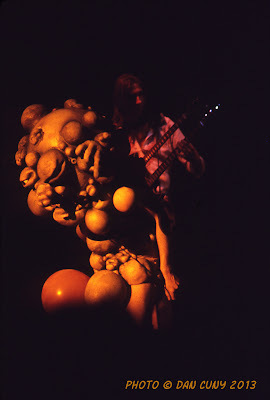 Berkeley Community Theatre was a better venue for Genesis than Winterland, being more suited to their highbrow style of prog rock, and it proved to be a favorable setting for their stunning production of The Lamb Lies Down on Broadway. 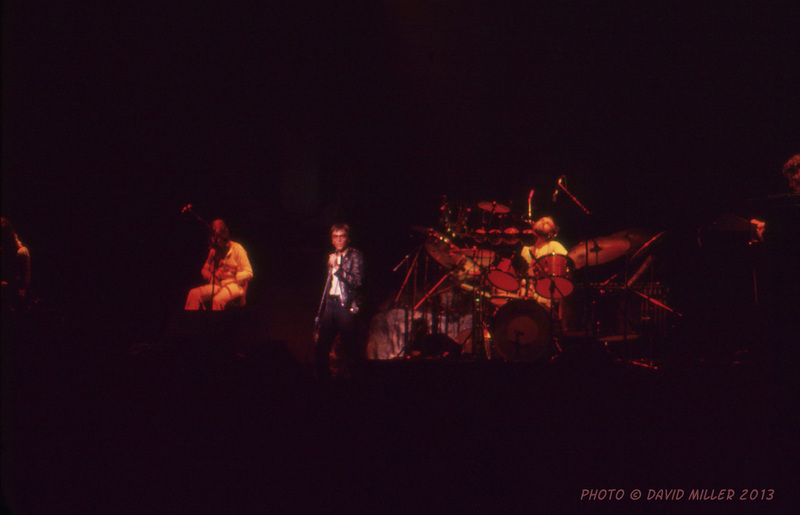 When we saw Genesis at Winterland in 1974, the turnout there had been fairly weak, and most of those in the audience had seemed a bit uncertain of what to think in regard to Peter Gabriel and his English eccentricities. 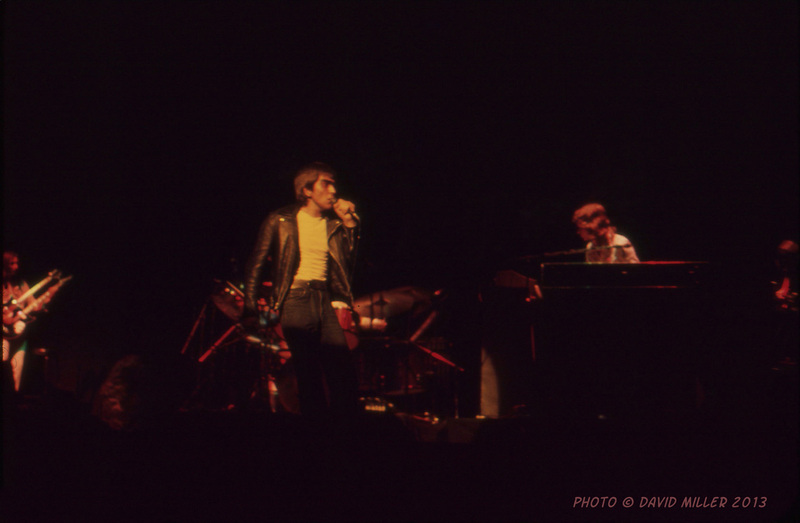 In Berkeley, in 1975, the crowd was much bigger and more excited, and they clearly were there to see Peter Gabriel, who then was starting to become a famous name. 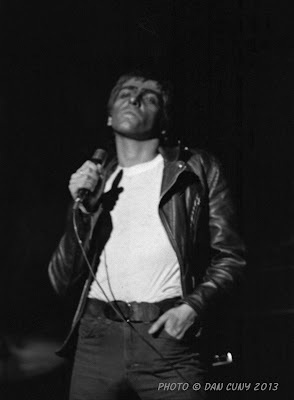 Actually, it apparently was Peter Gabriel's broad ambition as a performer that finally prompted his departure from the band. It seemed that he could no longer commit himself to working within the framework of Genesis. At the beginning of the evening, Peter Gabriel came across as a tough character, prowling the stage with a hard look on his face, as if he was trying out for a part in West Side Story. He brought Rael to life in a strong manner that was ardently physical and brightly compelling. The eye-catching trick in which he somehow appeared to be on either side of the stage at the same instant was especially impressive. The singular talent of Peter Gabriel was, inevitably and necessarily, at the forefront throughout the duration of the performance, but the collective musicianship of Tony Banks, Mike Rutherford, Steve Hackett, and Phil Collins also was outstanding. It was an unusual concert that stands out clearly in my memory, filled with varied elements (lights, props, etc.) that were strikingly effective and ahead of their time. 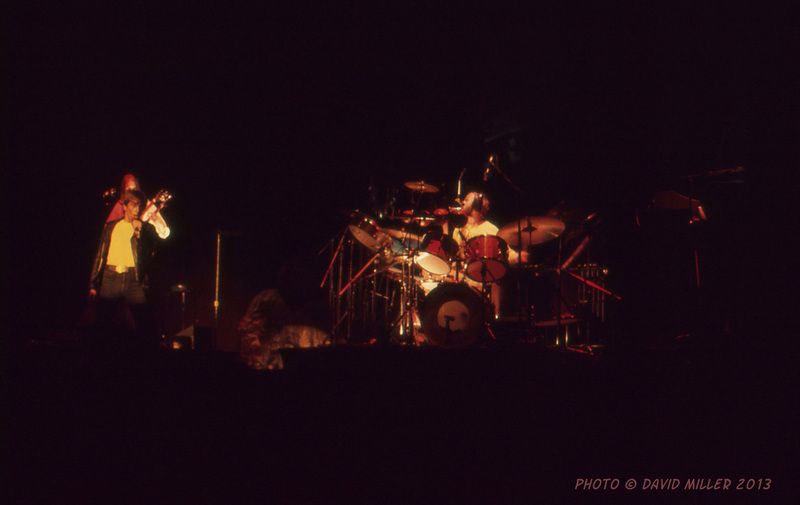 Performances of rock'n'roll in a grand mode are more frequent nowadays, but it was new and different in 1975. After the performance, at the stage door, we met the musicians, along with (if I am remembering it correctly) their wives and several small children, who apparently had come on tour with them. 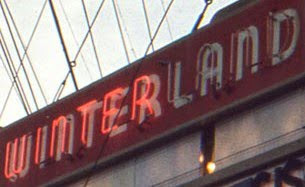 They were even less forthcoming than they had been on the first occasion that we met them, at Winterland, perhaps because of their wives and children being there. Nice article and great knowledge. Thanks for the share. 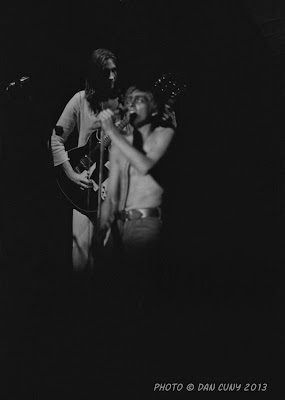 I love this music story and enjoy with your words! These are some of the best photos of the Lamb I have seen. 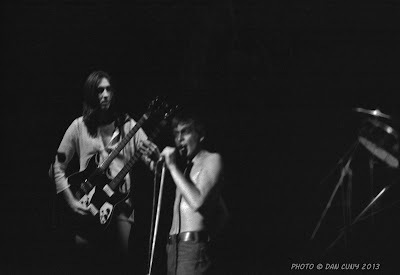 Was there a TV camera at the front during this show? Anyone take any 8mm film? Nice-thanks for the memories!!!! 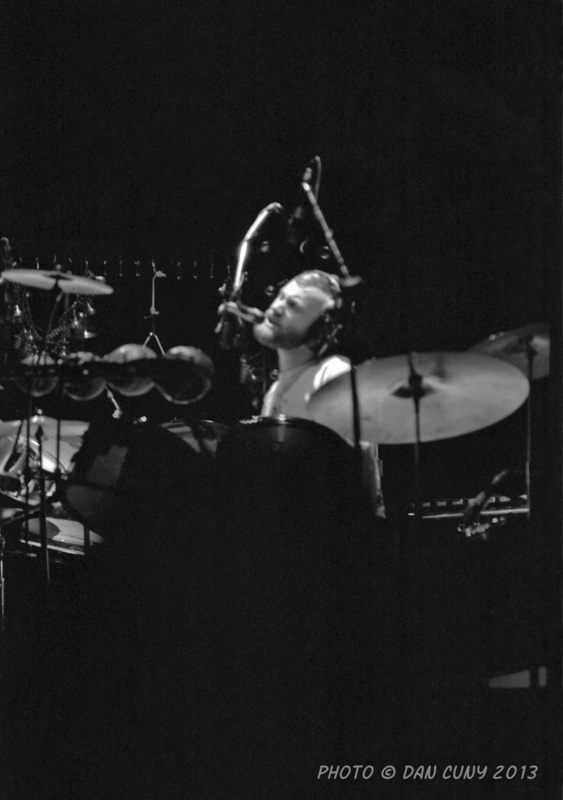 I wish I had caught this tour with Lamb maybe my favorite album. 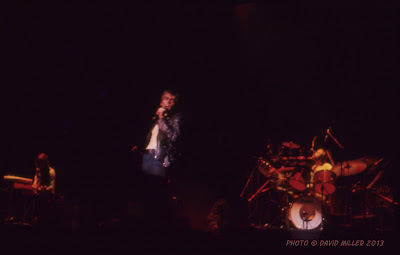 Love the photos and comments-wish I had seen this tour! !